The excellent free video cutter/merger/converter/downloader, etc. How to cut video online? Quite simple now since there are so many great sites that enable users to cut a video online. This review is going to show you 5 remarkable free online video cutters and the main features and tutorials of each tool are presented as well. Speaking of video cutting, there are many professional yet costly video editors come up to your mind. And they render you a dizzy interface and the complicated video editing steps hinder you from the quick video cutting process. Actually, to cut or trim fragments from videos and movies is easier than you thought. Even you can clip the footages from the video without installing any program since there are many free online video cutters that can satisfy your requirements effortlessly. Here I sort out the top 5 best free online video cutters, along with the specific steps on how to cut video online. 1: Cut videos by a few clicks at a sharp speed. 2: NO input file format or size limit. 3: Import videos in batches for trimming. 4: No watermark on the final output files. A versatile toolkit that can cut video online without hassle. As one of the best free online video cutter, online-video-cutter.com is capable of splitting videos in a few mouse clicks. Furthermore, it can serve as a video converter, joiner, recorder and more. And you can find the related functions on the menu bar. 1: On [https://online-video-cutter.com/], hit the “Open file” button to import video. 2: Drag the slider to save the wanted video sections from the footage. 3: Set the output video quality and format if you need. 4: Click the “Cut” icon to deal with how to cut video online. 5: Download the video to PC after cutting, or save it to online storage services. Tips: According to the official site, if you failed to upload some video files for cutting, the target files might be broken, and you need to repair the MP4, AVI, MKV files, etc. Pros: It’s free to use and you do not need to register an account. Compatible with most browsers and there’s no input file format limit. Moreover, the server will delete the videos after a few hours. Cons: Requires Adobe Flash Player for normal use. And there’s file size limit: up to 500 MB are supported. Besides, limited output formats: MP4, FLV, AVI, MPG and 3GP. A fabulous YouTube video cutter that can trim and cut YouTube videos at one go. Since many of you would like to upload videos to YouTube and you can directly cut the video on YouTube video manager. 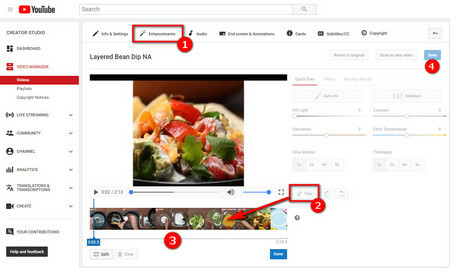 1: Head to [https://www.youtube.com/my_videos] and find the target videos you want to cut. 2: Choose “Enhancements” and click the “Trim” button to preserve the needed part and then hit “Done”. 3: And do not forget to press the “Save” button to save video in-place. 4: After done, you can choose to “Download MP4”. Pros: Easy to handle the video trimming. Besides trimming, you can take it to rotate video, add effects, speed up the videos, etc. Since YouTube accepts videos up to 128GB which means you can cut such large videos easily. Cons: Required Google account login and it’s exclusive to the videos you upload to your YouTube account. Has been deemed as one of the best video cutter online fast tools, Aconvert video cutter allow you to upload local videos and paste video URL for cutting. It has a clear and friendly user interface and the detailed video trimming steps are shown in the later part of the official page. Apart from cutting, you can convert, merge, rotate or crop video online with this site. 1: Go to [https://www.aconvert.com/video/split/] to import local or online video. 2: Set the video Start position and Duration. 3: Press the “Submit” button. 4: When finishes, choose to download the final videos to local disk or save them to Google Drive, Dropbox, etc. Tips: If you want to stream the video to your phone, just scanning the QR Code that this video splitter online service provides. Pros: Aconvert.com accept local videos or URL videos for splitting and able to cut the selected video without decoding, encoding or converting. More supported input video formats: MP4, AVI, FLV, MPG, MKV, WMV, M2TS, WEBM, ASF, MOV, M4V, RM, VOB or OGV. What’s more, the final video will be deleted from the server automatically after an hour. Cons: Video file size can be up to 200MB only. Sometimes, the server might fail to recognize the pasted URL. Compared to other similar free online video cutters, wincreator.com can operate at a relatively fast speed yet its acceptable video file size is far less than others. So if you are going to cut some small clips, this site can be a great choice. 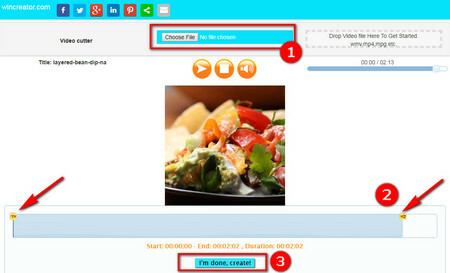 1: Visit [http://www.wincreator.com/video-cutter] to upload videos to the server. 2: Marking the video starting point and endpoint. 3: Press “I’m done, create!” to cut video online. 4: Download and enjoy the final output file when cutting is over. Pros: Easy to handle and new users can master the clip steps at the first time. You can preview the videos while trimming. Cons: Merely accepts video file size up to 50MB. And there are limited supported input video formats: WMV, MP4, MPG, etc. A highly praised site to allow users to cut video online free. Just as its name implies, this online service renders people many useful features like add subtitles, extract subtitles, add watermark, join videos and so forth. But it’s a pity that it does not support and convert H265 videos for now. 1: Register an account at [http://www.videotoolbox.com] then choose the “File Manager” in the left part of the page. 2: Upload the target videos. Here you need to hold on a while and the uploading time is based on the network speed and the video file size. 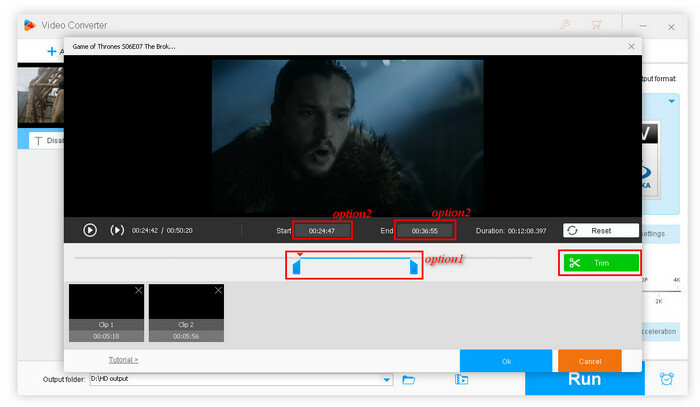 3: Check your videos then choose “Cut/Split file” on the “Select action” part. Now you are able to cut the videos by moving the duration slider or specifying the start time and end time. 4: Select “Cut the slice (same format)” or “Convert the slice” at will. Tips: The total file size for standard subscription plan is 1500 MB a month. And the server will automatically delete the upload files older than 1 month and the output files older than 24 hours. Pros: Able to input videos up to 1500 MB in the FILE MANAGER. Functions at a relatively fast speed. It will show you the detailed video parameters like codec, bit rate, frame rate, resolution, etc. Cons: Registration needed and there are advertisements on official page. Moreover, it will add a text watermark to your video file. There are many inherent limits of the free online video cutters, like all the server are affected by the internet connection greatly and there are ads on the official page or slow uploading and cutting speed, embed watermark to videos, etc. And what if there’s a free tool that can get rid of all the above defects and can cut your videos fast yet easily, what would you do? Just go ahead and take it. Free HD Video Converter Factory is the exactly right tool to trim or split the videos at one go. Besides, after continuous technical updates, the latest version of the Free HD Video Converter Factory accelerates three times the cutting speed. Now, let’s enjoy the fun of cutting video rapidly. 1. Free downloadFree download and install it on your computer. 2. Open this toolkit and then import the target videos. 3. Click the scissor-like icon to move up to the video cutting window. Here you can cut the video by dragging the slider or customize the specific start time and end time. Then choose OK to save the setting. 4. Choose the output format based on your needs. All the mentioned toolkits are free to use and with this review, you can easily carry out how to cut video online and offline. The best video cutter and free HD video editor for Windows PC and it has more basic video editing functions like crop, merge, rotate, add special effect, add mirror effect and more. Also, you can take it compress videos losslessly or improve video quality from SD to HD, HD to 4K. Free download it here to have a try.